Register as an individual if you do not have a teammate and would like to be paired up with another individual. Register as a Team. Include your teammates name as the guest registrant. An additional $25 will be added to the invoice for the guest registrant. Individual Registration is for those without a partner. Team Registration is for those that already have a partner. 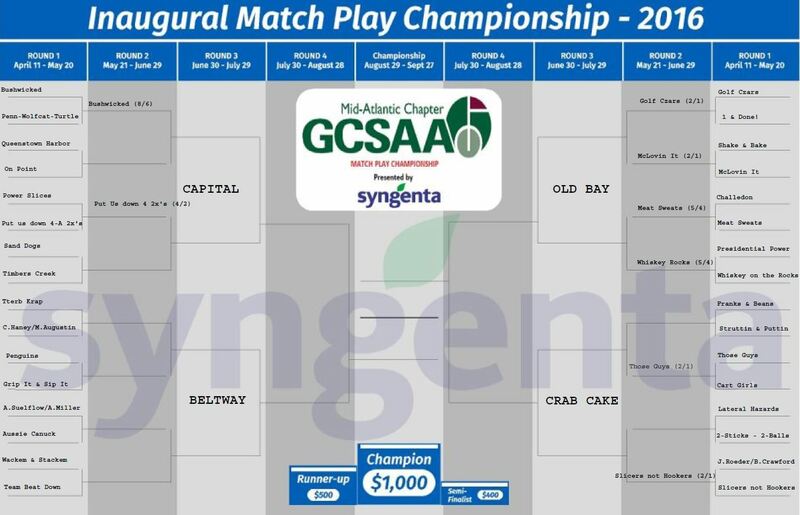 32 teams will square off in five rounds to see who will be crowned Champions of the Inaugural MAAGCS Match Play Championship! This is a great event for networking with fellow MAAGCS members along with mixing in friendly competition and great prizes. Round 1 groupings will be done by region. Teams are responsible for arranging the date, site and completion of each match and reporting the results. The winners advance to the next round and losers are eliminated from the competition. Winners will be crowned Champions at the Annual Meeting. Registration Note: You may register as a Team or as an individual that needs a partner. For Team registrations please include your teammates name in the guest field. If you are an individual player you will be paired up with another individual looking for a partner.